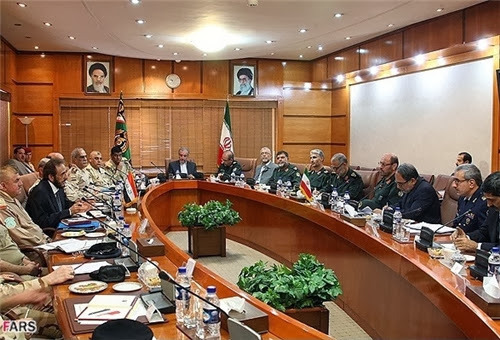 Iranian Defense Minister Brigadier General Hossein Dehqan and his Iraqi counterpart Sadun Farhan Al-Dulaymi, in a meeting in Tehran on Tuesday, explored avenues for bolstering and reinvigorating the bilateral defense ties between the two neighboring nations. The Iranian and Iraqi defense ministers underlined the need for the further expansion of the bilateral ties and mutual cooperation between the two countries. Al-Dulaymi is heading a high-ranking delegation to Iran, and his visit takes place at the invitation of Brigadier General Dehqan. The Iraqi army’s chief of staff as well as the country’s ground force, air force and navy commanders are accompanying Al-Dulaymi during his visit to Iran, which will be his second since he was appointed as Iraq’s defense minister. Definitely not what the Bush administration had in mind when invading Iraq ten years ago. It's presumed the IRGC is suggesting solutions that previously worked for Iran to be applied in Iraq's current counter-terror efforts, as well as discussing military-related consequences of the ongoing Takfiri fight in neighboring Syria. indeed Iran has a lasing solution to the mayhem of killings going on in Iraq sponsored by Bandar Bush-Saudi Arabian prince of terrorists!. The destruction of national Iranian identity and the establishment of a greater shia empire.What do you expect when you have a regime in Tehran run by creatures whose origins come from Iraq. Anon 5:56 AM....Correct ! And may I add that some of Khameini's security forces belong to Iraqi families that come from Najaf and Karbala.It is far more important to them to be a good shiite than a good Iranian even if it means you are an Iraqi. Iranians have become second class citizens in their own country. blah blah blah bleep bleep bleep, same old tired non sense. The same thing will happen in Afghanistan. Once everybody pulls out of there, Iran will come to the rescue. Thus clearing out both flanks from foreign threats. Yes, I understand your frustration because you know the truth hurts when you run out of words. no, it damn well will not happen in Afghanistan. there's no love for Iran and its minority Muslim religious views over there. That Guy you are answering above is a lazy researcher !.Today Iran is so dear to Afghans than any Nation.And this explains the reasons why the Taliban made some visit recently as announced.-THE Sunni Taliban are bitting their fingers with remorse for rattling IRAN during their rule only to learn that there is a brotherly neighbor in shite IRAN who is worthy courting than Pakistan and SAUDIA! !.